Home > Dining and Gourmet > Fast Food > McDonald’s: Coupon Codes for FREE 6pc McNuggets, Filet-O-Fish, Hashbrown, Large Fries & Oreo McFlurry when You Order McDelivery! Till 24 Mar 2019 McDonald’s: Coupon Codes for FREE 6pc McNuggets, Filet-O-Fish, Hashbrown, Large Fries & Oreo McFlurry when You Order McDelivery! 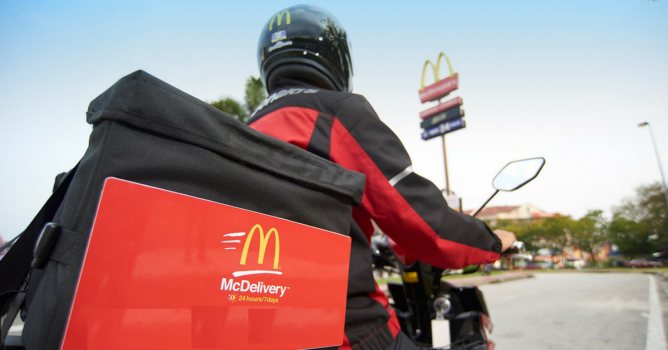 Ordering McDelivery this month? Use these coupon codes for FREE 6pc McNuggets, Filet-O-Fish, Hashbrown, Large Fries & Oreo McFlurry from now till 24 March 2019. Minimum spend applies. Promotion: McDonald’s Coupon Codes for FREE 6pc McNuggets, Filet-O-Fish, Hashbrown, Large Fries & Oreo McFlurry when You Order McDelivery! YAY4FILET -FREE Filet-O-Fish Ala Carte with min. $19 spend excluding delivery charge. Available from 12nn - 3.45am, while stocks last. FORSHARING -FREE Chicken McNuggets (6pc) Ala Carte with min. $16 spend excluding delivery charge. Available from 12nn - 3.45am, while stocks last. CRISPYCHIX -FREE Large Fries Ala Carte with min. $18 spend excluding delivery charge. Available from 12noon to 3.45am while stocks last. LIMITEDEDT -FREE Hashbrown Ala Carte with min. $10 spend excluding delivery charge. Available from 4am - 10.45am, while stocks last. CHILLOUT19 -FREE Oreo McFlurry Ala Carte with min. $18 spend excluding delivery charge. Available from 12nn - 10pm, while stocks last. Conditions: May apply to selected customers only. Enter coupon code upon checkout. To use your coupon code, please ensure that your cart items meet the minimum spend (excluding delivery charges). Once done, go to 'My Order'. Click on 'Got a coupon code? ', enter your code and hit 'Apply'. Easy! Previous: Cotton On: 50% OFF 1000s of Styles Online & In Stores! Next: [FOREVER 21] We’re selling out!